The best steakhouse in town? Your house! 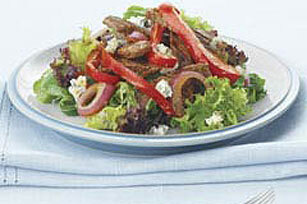 Especially when you're serving up innovative dishes like this Warm Steak and Blue Cheese Salad. Heat 1 Tbsp. of the dressing in large skillet on medium-high heat. Add meat; cook 2 min., stirring constantly. Add peppers and onions; cook and stir 5 min. or until meat is cooked through and vegetables are crisp-tender. Stir in remaining dressing. Place 2-1/2 cups of the greens on each of four salad plates. Top evenly with the meat mixture and cheese just before serving.